December 29th, 2017, I went simploring in the afternoon. Once again I followed a post from Inara Pey’s Living in a modemworld blog “A photogenic twirl in Second Life“. La virevolte is French and means turn or twist, hence the title of Inara’s post. And La virevolte is really picturesque but natural, it offers great opportunites for taking pictures. La virevolte is owned and created by Iska (sablina). There’s no landmark description. I looked up Iska’s profile which is quite empty except of one sentence “I love creating landscapes and dreaming inside“. For me these few words describe La virevolte perfectly. You can enjoy lovely views and you can dream and wind down there. 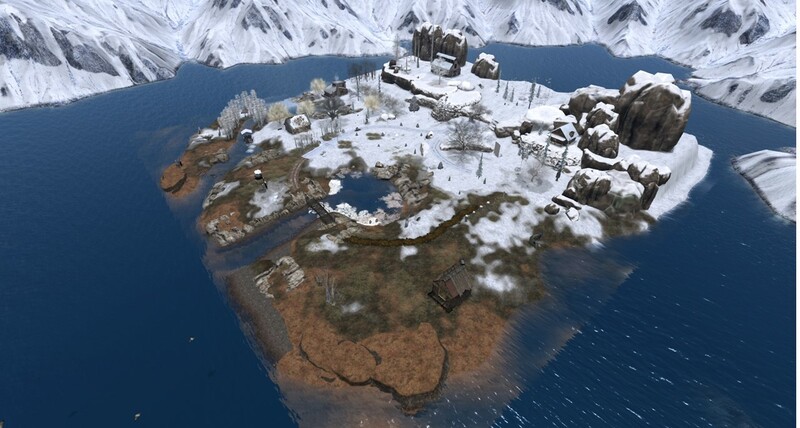 La virevolte is an island perfectly melted in a sim surround of high Mountains. The island itself has a flat part with no snow – it looks as if the wind has blown away the snow from this part of the island – and some higher rocky parts. There are a few houses spreaded on the island, also a few ruins. In the center a small natural fjord ends in a small pond. La virevolte looks really natural and I couldn’t get enough from the different views. Although it seems that there’s not much activity you can find some Christmas illuminations here and there and even around the ruins. During my visit, Jenny came inworld and joined me there. She was not dressed for the cold. We tried some ot the places to cuddle and enjoyed the peace together. I think my pictures do show some of La virevolte‘s beauty. 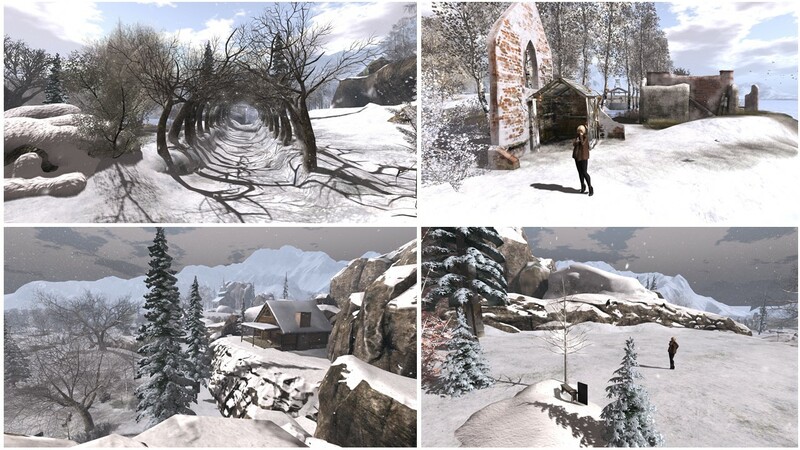 If you like winterly sims, don’t miss this sim and visit it before spring arrives. Well, it might be lovely in sping as well and another reason for me to return then. Thank you Iska for sharing your dream with the public. I enjoyed my visit very much!